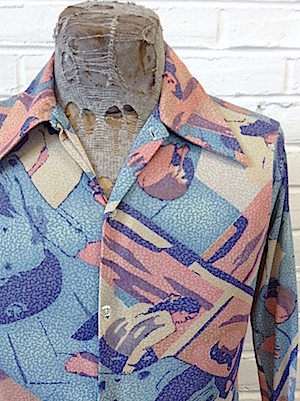 (XXS) Mens Vintage 70s Disco Shirt!! Pastel Neo-Impressionism w/ Ladies Lounging! Home > Men's Vintage Shirts > Disco Shirts > (XXS) Mens Vintage 70s Disco Shirt!! Pastel Neo-Impressionism w/ Ladies Lounging! Mens vintage 1970s disco shirt. 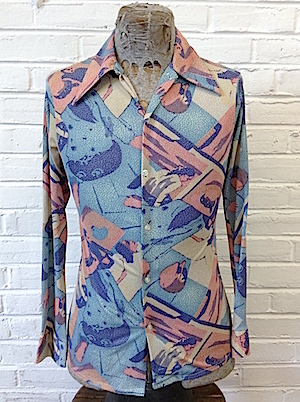 This groovy disco shirt comes in a soft pastel palette of blues, peach, yellow with dark violet outlines. Pastel colors are broken into fragmented planes of color with busy little marks on top that give it an impressionistic feeling. Amongst all of these wild marks and color is an image, defined by dark violet of ladies lounging. Has a super wide & pointy disco era collar. Closes in the front with pearly white buttons with one more on each cuff. Shirt has a tapered hem. Nylon/Acetate blend.